While checking the weather forecast I suddenly realized that the temperature would soon touch sub-zero. The winter jackets have already started coming out of the closets and the trees are fast loosing their leaves. Winter is here once again and with the advent of winter the atmosphere here in Europe fills up with the spirit of Christmas. The Christmas lights of Champs Elysees have already been lit and the Christmas market that runs from mid-November until early January will start this week. 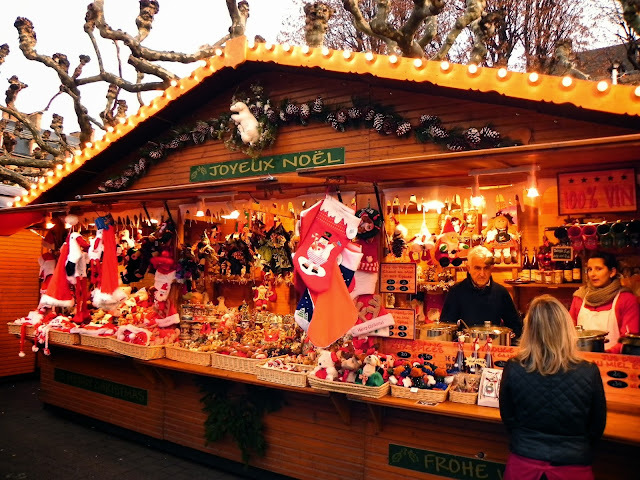 Christmas markets are not that popular in France, though such markets are now being held in certain cities. 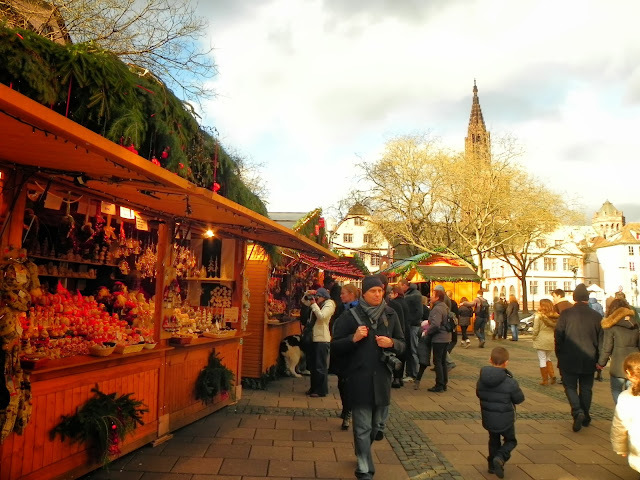 It is more of a German tradition of having such street markets during Christmas, with some of the oldest ones dating back to the late middle ages. However in France, one can always enjoy such markets, with the ones in the Alsace region boasting of a tradition as old as the German ones. I frankly do not remember the source from where we came to know of it (may be Mitra's ramdom clicks on his computer), but once we did we made it sure not to miss the opportunity to relish it. Before narrating our pleasurable experience at Strasbourg, the capital of the Alsace region, it is important to present a brief history of Alsace and thus the reason why such a German tradition is also an integral part of the Alsatian culture. 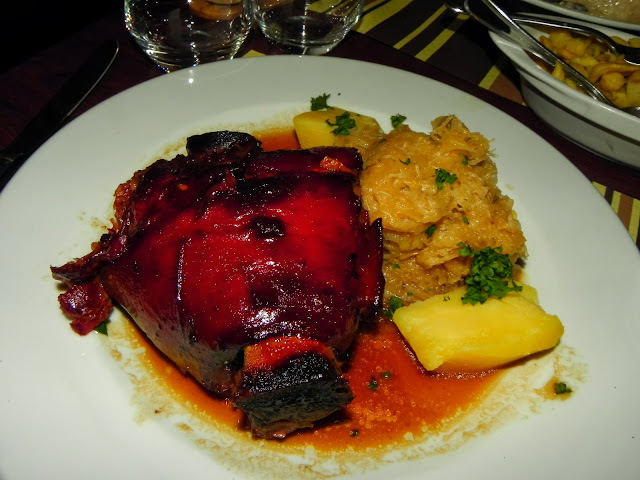 In fact the Christmas market is not the only German stuff that you would find in Alsace. 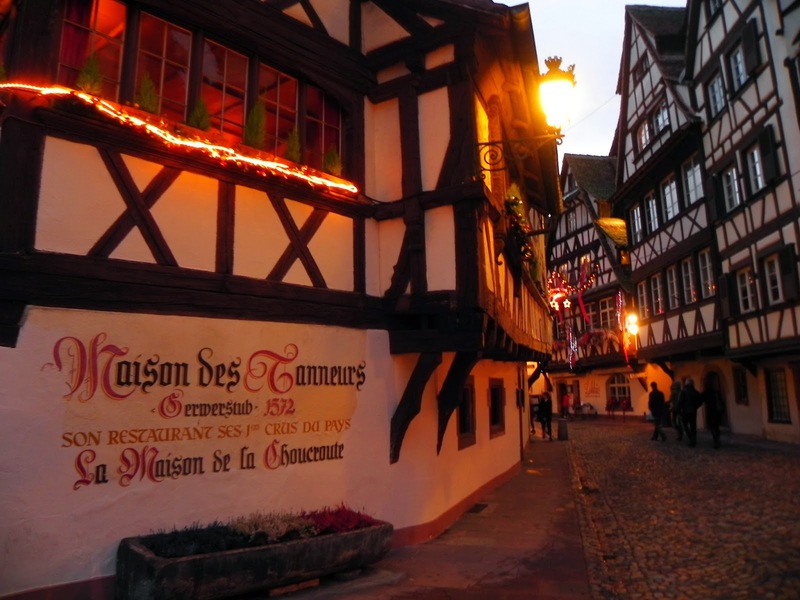 It also shares the German architecture, the German pretzels and ofcourse German beer with Alsace being the main beer-producing region of France. The story starts in the times of Charlemagne when he forged the Frankish empire, about three centuries after the collapse of the Roman empire. The greatest expansion of the Frankish empire was secured by the early 9th century from which evolved the subsequent German and French empires. The three grandsons of Charlemagne divided up the empire among themselves with the Treaty of Verdun in 843. Louis took control of East Francia from which evolved the Kingdom of Germany, Charles the Bald reigned over West Francia which later became France while Lothair recieved te central portion of which Alsace was a part. Ever since the death of Lothair in 855 Alsace has found itself being juggled among the two powerful neighboring kingdoms of France and Germany. France had held Alsace for about 200 years starting from 1674 but lost it once again to the Germans after the Franco-Prussian war. Finally the German defeats in the two World Wars meant Alsace was firmly incorporated into the French Republic and thus stems its present affiliation. 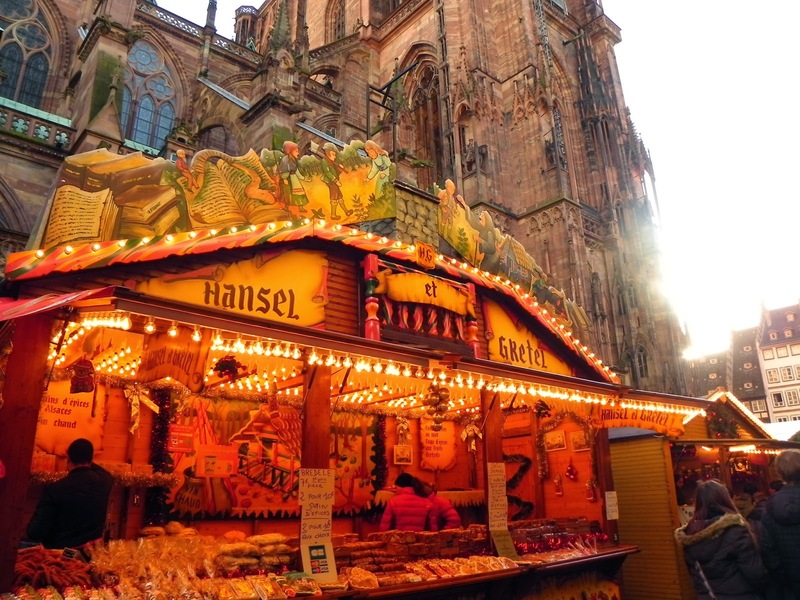 So the German influence on the Alsatian culture is obvious and one such influence results in the Christmas market being held in Strasbourg since 1570. We took the early morning train on 24th December, from Paris-Est because we wished to enjoy as much of the day as possible in Strasbourg at the Christmas markets. Well, frankly we took the train at around 8.30 A.M. more because the trains at the wee hours of the morning are generally much cheaper. It takes a little more than two hours to reach Strasbourg and we arrived at around 11 A.M. when the stalls had just started to charm their clientele. Without wasting any time we checked into our hotels, dropped our baggage and were out exploring the city which had turned into a theme park of Christmas. The city at this time is aptly called the "Capital of Christmas" (Capitale de Noel in French) and we felt as if we had walked into one of those Christmas stories that were read to us at bedtime many years back. But in such a place and during such a time, one suddenly realizes that one is never too old for teddy bears, soft toys, fairy themed displays and other delights of childhood times. The historic center of Strasbourg is actually an island called the Grand Ile on the river Ill, a tributary of the Rhine. The entire city center was classified as an UNESCO World Heritage Site in 1988 making it the first city center to receive such an honor. In the 17th century, a dam was built on the point where the river splits up around the city center called the Barrage Vauban to protect the city from floods and it serves the same purpose even now. We were quick to take advantage of the other purpose that Barrage Vauban serves today. 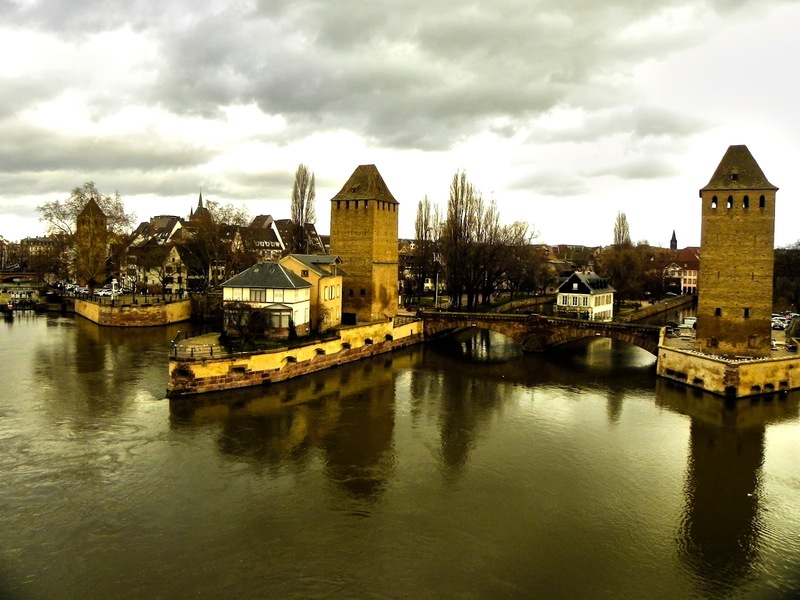 From top of the barrage there is an excellent panoramic view of the entire historic center of Strasbourg with the towers of a medieval covered bridge still standing tall. This was our vantage point from where we marked the spots we were about to strike in this flood of decorated kiosks. Prior to Christianization, the Germanic peoples celebrated a midwinter event called Yule. With the Christianization of Germanic Europe, numerous traditions from Yuletide celebrations were absorbed into modern Christmas. In around the 14th century large cities of the erstwhile Germanic Holy Roman Empire including Strasbourg started organizing fairs called Klausenmärik or ‘Saint Nicholas Market’ named after the 4th century Greek bishop Saint Nicholas of Myra who was famous for his generous gifts to the poor and specially to children (and ofcourse the inspiration of our modern Santa-Claus). On 22 December 1570 the municipal council of the Strasbourg, decided to continue the traditional fair but dedicate it to Christkindel, the Infant Jesus. Ever since then the Christkindelmärik of Strasbourg has been enchanting its visitors which now number to approxiately 2 million per year. 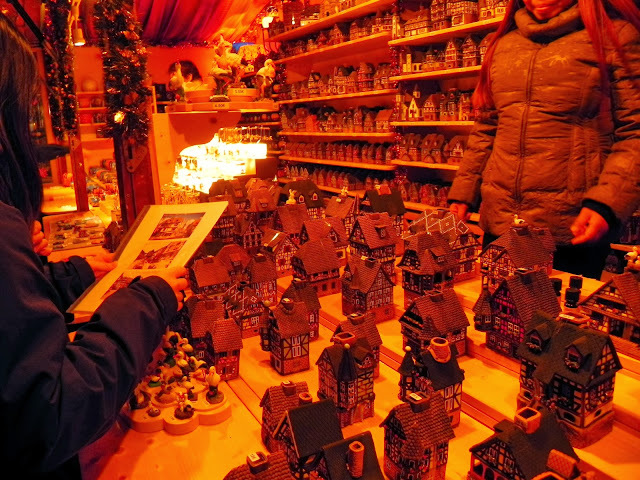 It is thus considered as one of the oldest and most famous Christmas markets in Europe. After 1870, the Christmas market was set up in the place Broglie on the Grande Ile, where it still bustles today. The same products from back then continue to be sold there: fir trees, Christmas decorations, cribs, ornamental figures, locally-made handicrafts, confectionery and culinary delights accompanied by mulled wine. 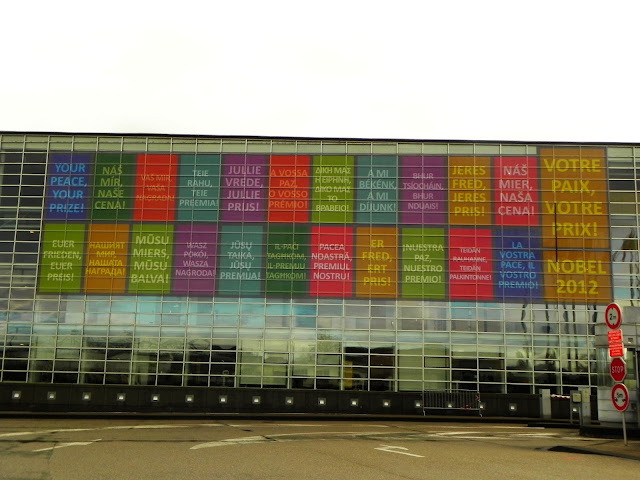 Since the 1990s the market has spread to different parts of the city and each of the ten main squares of the city has a market with an unique theme. 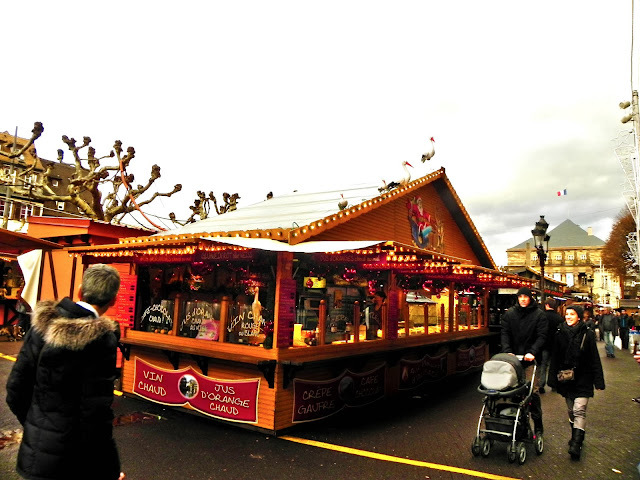 For example the one at Place Temple Neuf was dedicated to Christmas decorations while at Place Saint Thomas it was aimed to attract kids and looked more or else like a mini Disneyland. At Place Guttenburg each year one country of the world is invited to hold a themed market and that year it was the turn of Georgia. Kiosks dedicated to Alsatian wine filled up Place d'Austerlitz while local culinary delights such as Foie Gras were available at Ancienne Douane. 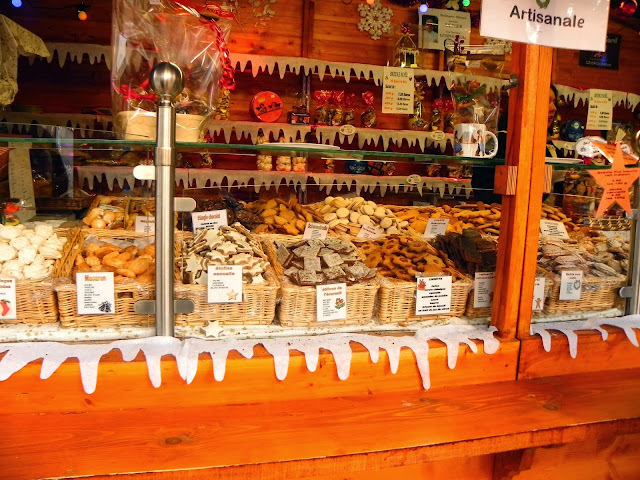 Bredele are biscuits traditionally baked in Alsace especially during the Christmas period. Anisbredele (with aniseed), schwowebredle (orange and cinnamon) and small pain d'épices (spice cakes) were avaiable in generous quanties for tasting and then eventually to buy. I would come back to the wine and food later as any blog on Alsace is never complete without touching its gastronomical grandeur. Another interesting thing that was available in all the markets, were miniature models of real houses of the city, with the respective address inscribed on it. The traditional Alsatian house, like other regions of Germany and Northern Europe is constructed with walls in timber framing. The medieval half-timbered houses with the visible wooden frames have survived the wrath of fire, floods of the Rhine and ofcourse the two world wars and have now become a symbol of the region. Such houses with the winding cobblestone streets are abundant on the Grande Ile and specially in the picturesque district called Petit France and justify the city's affiliation as an UNESCO World Heritage site. Apart from the half timbered houses, the architecture of Strasbourg is an astounding combination of German Gothic of which the towering sandstone Strasbourg cathedral is one of the finest examples, the German Renaissance such as the Kammerzell House just infront of the cathedral and French Baroque among which the Palais Rohan is the most spectacular. 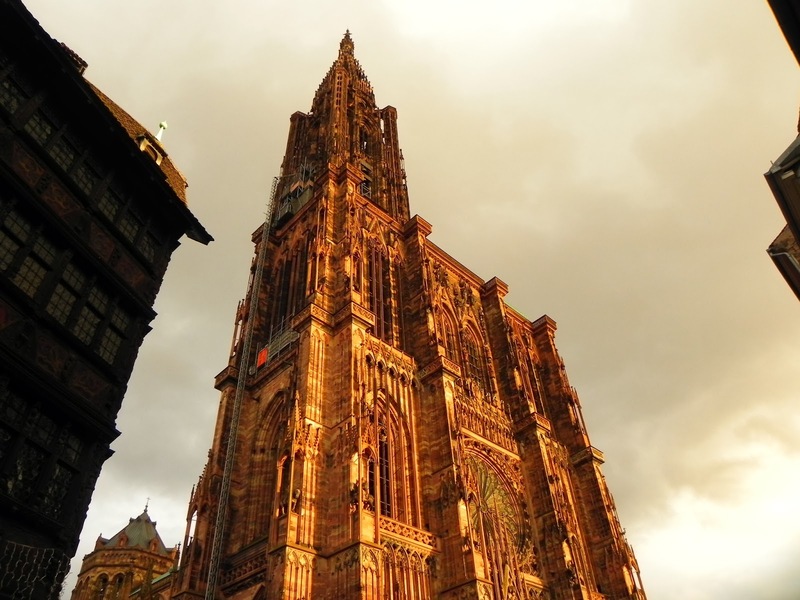 The Strasbourg Cathedral was described by Victor Hugo as a "gigantic and delicate marvel" and by Goethe as a "sublimely towering, wide-spreading tree of God" can be seen from as far off as the Vosges Mountains or the Black Forest on the other side of the Rhine. No Christmas celebration is complete without a Christmas tree. Towering at 33m here at Strasbourg stood the tallest natural Christmas tree of Europe. The people here also believe that the tradition of decorated trees during Christmas originated in Alsace (in the erstwhile German Holy Roman Empire). The story goes back to the middle ages when the Tree of Paradise decorated with apples were set up in the city centers on Christmas eve. According to the legend, once there were not enough apples to decorate the tree and the people used glass balls from the local glass blowers to replace the apples and thus the Christmas bauble was born. I am not sure if this legend is true but what we surely know is that the Christmas tree originated in Germany and that we were standing in-front of the tallest tree in Europe. 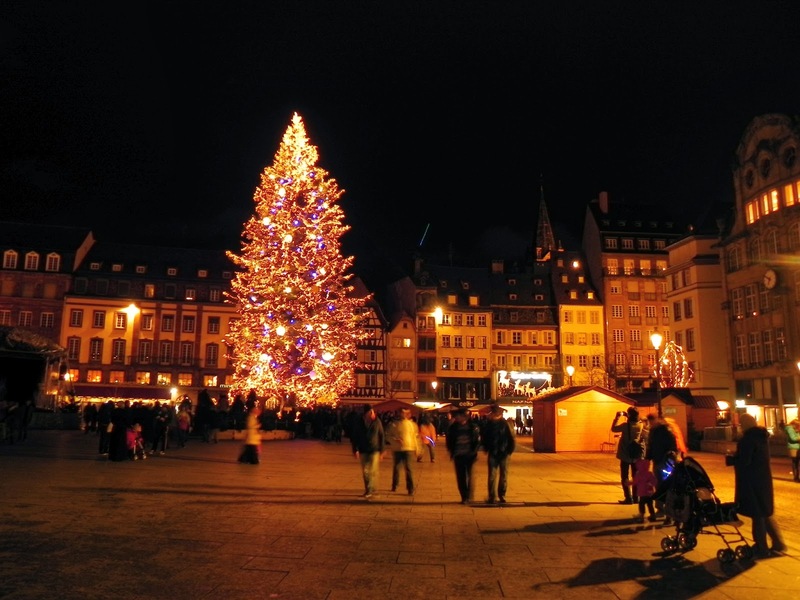 One of the tallest firs that grow in the neighboring Vosges mountains is erected every year at Place Kleber, the largest square of Strasbourg. Apart from the tree the square was also host to booths of about 50 charitable associations that make up the Village du Partage (village for sharing). Place Kleber is named after Jean Baptiste Kleber, one of the greatest generals of the French Revolutionary epoch, who was born in Strasbourg. During the French Revolutionary Wars in 1792 it was here in Strasbourg that "La Marseillaise" was composed by Claude Rouget de Lisle to motivate the French Army, which now is the National Anthem of France. It was in Strasbourg that we discovered a wine, which ever since then have become our favorite among the white wines. 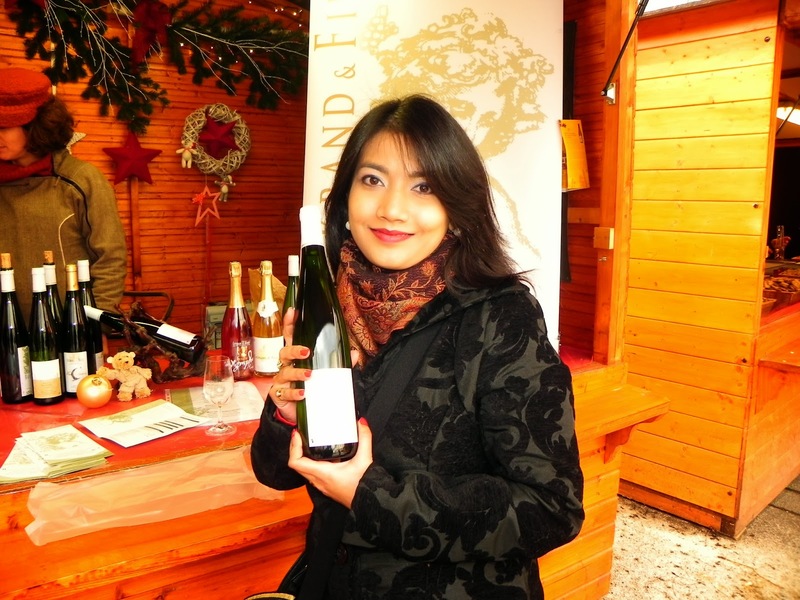 Alsace wine, mainly the white ones, is quite popular in France for the same reasons as the Alsatian culture is revered. Alsace being a fine blend of French and German cultures, its wine too is produced typically from similar grape varieties to those used in German wine. But the grapes when grown on this part of the border takes an unique character and the resulting wine is a pleasure for the senses. Almost all wines here are white, except those made from the Pinot noir grape which are pale red. 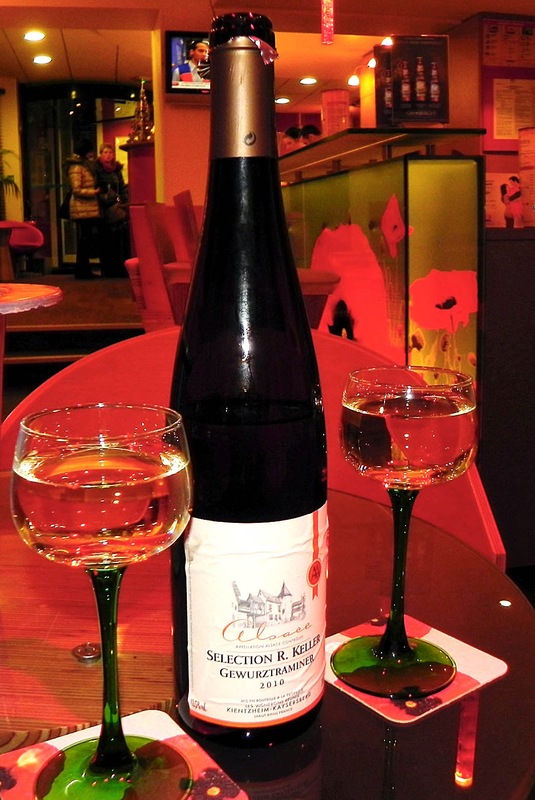 Much of the white wines of Alsace are aromatic, floral and dry which makes them different from the German wines though made from similar grape types such as Riesling or Pinot Gris. But our favorite wine happens to be the one produced from Gewürztraminer grapes, which sets completely a new definition of aromatic white wines. Chemically the grapes share the same aroma compounds as those of the tropical fruit lychee and thus a lychee flavored wine is something that was quite unexpected for us and ever since then has become a temptation we can hardly resist. We discovered the wine first at our hotel bar and we fell in love with its flavor almost immediately. We then went on to buy two bottles and taste as many at the Christmas market in Place d'Austerlitz which was dedicated solely to Vin d'Alsace. Apart from the cold white wine the warmer version of the wine, Vin Chaud (mulled wine) from the kiosks helped to keep us warm in the near freezing temperature of late December. The gastronomy of Alsace is the icing on the cake of French cuisine. Alsatian cuisine like everything else here is a combination of French and German techniques. The symbolic dish here is the Choucroute (Sauerkraut in German), the fermented finely cut cabbage and is served with various forms of sausages or other pork products. Pork is the main meat eaten here and we were lucky enough to taste some of the luscious delights that can be created with it. Infact they can create wonders with any kind of meat and the Poulet au Riesling (Chicken with Riesling wine) is a testimony to that. 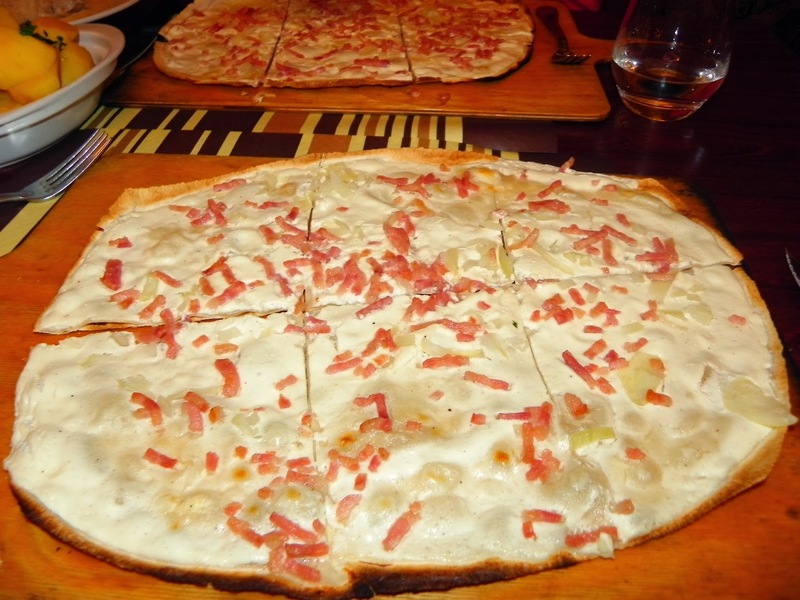 Another dish that we loved was Tarte Flambée which looks like a rectangular pizza but made with fresh cream and pieces of bacon. Strasbourg is a Gallicized name is of Germanic origin and means "Town of Roads" because of its historic location on the important trade routes and it has continued its relevance in the European unity with it being the seat of the European Parliament. It has also been the node of dispute as well as of accord between France and Germany and today the bridge called Pont de l'Europe stands across the Rhine crossing the Franco-German border to join Strasbourg with Kehl in Germany. On that bridge you will not feel you are crossing the border between two different and historically rival countries. It was the year the European Union received the Nobel Peace Prize and if one had any doubts about the reason for it, this border crossing will clear it all. Our third and the last morning in Strasbourg was spent admiring the symbols of European unity with a tour of the Parliament and then the Pont de l'Europe. Thus after spending three days in the magical capital of Christmas we took our train back to Paris with the wish to come back soon to this city of crossroads, the French capital of Christmas.